In addition to relief through the parish poor rate, the poor of Wallingford benefited from a number of benefactions and endowments (Hardman, 1994). For example, in 1616 Sir Thomas Bennett of the London Company of Mercers and a native of the parish of Clapcot set up a fund to distribute £20 a year to fifteen elderly poor who were regular church attenders. In 1680, John Angier and his sister Mary bequeathed £870 to the poor of Wallingford of which £200 was used to build almshouses on the Reading Road. A parliamentary report of 1777 recorded the operation of a workhouse in Wallingford parish of St Mary the More which could accommodate up to 50 inmates. Parish of St. Mary contains about 30 acres. The contractor who farms the Poor receives £300 a year, for which he undertakes to supply all the Poor belonging to the parish with victuals, and clothes. The parish pays doctors, and attorney's bills, etc. The Poor are not employed in any manufacture; but such as can do a little work, are allowed to go out of the Poor-house, wherein they are maintained by the contractor. The introduction of a woollen or linen manufacture would perhaps be serviceable to this part of the country. A mixture of agriculture and manufactures, more especially when the latter are scattered through a country, seems to be the most effectual method of keeping the Poor in constant employment. Country manufacturers escape the immorality and dissipation too much connected with large towns; and have this further advantage, that in the occasional stagnation to which all manufacturers are subject, or upon an unusual demand for agricultural labour, they can vary their occupation; a mode of life, which (notwithstanding the many national advantages pointed out by the advocates for the division of labour) seems to be not more conducive to the health than congenial to the natural disposition of mankind. The following is the usual weekly rotation of diet in the Poor-house: Breakfast, all the week—Milk pottage or broth; Dinner—Sunday, Tuesday, Thursday, Saturday— Butcher's meat, bread and vegetables; other days— Cold meat; Supper, all the week—Bread and cheese. There are no friendly societies at present in Wallingford. There were two, not instituted on a good plan. Their funds decayed so fast that they found it advisable to break up their clubs, and divide what money remained among the members. The parish of St. Leonard has no Poor-house; the Poor are relieved at home. In 1807, Wallingford parishes of St Mary, St Leonard, and St Peter formed a union under the terms of Gilbert's Act of 1782 and built a workhouse for 282 inmates on the north side of the Wantage Road, about half a mile west of the town centre. On 23rd May, 1808, the workhouse Guardians appointed Mr James Dehay of South Moreton as surgeon, apothecary and man-midwife for the poor of the union (outside the workhouse as well as inside) at a salary of 30 guineas per annum, which also covered drugs, medical applications and attendances, except for those involving venereal disease. In 1828, the parish agreed to employ all able-bodied men applying for work in digging for stone. An area called the "Pit" in the workhouse garden was opened for this purpose, with labourers paid a daily rate of 9d for married men, 6d for single men over fourteen, and 3d for boys; a foreman received 1s.3d. The working day was 8am-4pm with an hour's dinner-break. I found that the guardians were annually appointed, and did nothing ;—in fact, they were ignorant that they had any official duty to perform beyond keeping the workhouse in repair ; the overseers paid the poor, and all the abuses consequent upon that method of giving relief, flourished in the union just as out of it. The workhouse was divided into apartments, each furnished and tenanted by a family, by whom it was evidently regarded as their freehold; one woman had resided there for eleven years, and brought up a family of nine children; a shoemaker who had been an inmate seven years, told me that he earned his own living, and indignantly asserted, that he was entirely independent of the parish; in some rooms were young people just beginning life, having been lately married ; in others three or four unmarried mothers, or those who were on the point of becoming so; in some were the sick, or those whose age and infirmities showed that they were on the verge of dissolution; 47 children were variously deposited throughout the building; one room only was vacant ; on my asking the cause of this, I was informed that it was reserved for some preachers of the Methodist persuasion, who attended twice a week to hold a preaching, and a prayer meeting; those of the inmates who desired it were made members of the congregation, upon the weekly payment of one penny. There was not the slightest attempt at classification ; old and young, male and female, sick and sound, were left to mingle at will ; the discipline that could be maintained amounted to nothing ; a man (who was parish beadle) and his wife, themselves just removed above pauperism, were dignified with the titles of governor and matron ; or, as the woman more properly described their situation, they were paid 12s. per week "to set things straight, and keep all quiet:" the means resorted to, in order to effect the latter of these desirable objects, were novel and summary; when a pauper, in consequence of indulgence during the day at the beer shop (for be it remembered, by day there was not the slightest infringement on their liberty), was noisy and troublesome at night, the governor left his bed and turned him out of doors! It appeared that on a vacancy occurring in this parochial lodging-house, a sort of scramble ensued between the united parishes, each being anxious to secure a rent-free tenement to some pauper who was a burden to it. Such an establishment could not possibly answer anyone good end: It only served to enhance and disseminate mischief. A parish workhouse existed at Dorchester from around 1742. It was located at the south-west of the village on the edge of the present allotments which was formerly Hempcroft. The workhouse was initially managed by a woman who in 1755 received the sum of £33.7s.3d. In 1764, the contractor John Wallis was paid 30s. per week, with the parish paying the rent of the house. Wallis was required to maintain all the poor in a decent fashion, except for smallpox cases, those with broken bones, or bastards. He also had to buy three beds and bedding, seven bedheads, and three spinning-wheels. He was not responsible for any expenses relating to resettlement. The parish also paid for hemp seed and the digging of ground rented by the parish. This was probably intended for the paupers to harvest and spin. In 1777, a parliamentary report recorded the Dorchester workhouse as accommodating up to 20 inmates. Berkshire: Aston Tirrold, Aston Upthorpe, Brightwell, Cholsey, Didcot, East Hagbourne, Little Wittenham, Long Wittenham, Moulsford, North Moreton, South Moreton, Sotwell, Wallingford Allhallows and Clapcot, Wallingford St Leonard, Wallingford St Mary-le-More, Wallingford St Peter, West Hagborne. Oxfordshire: Benson, Berrick Prior, Berrick Salome, Crowmarsh Gifford, Dorchester, Ewelme, Mongewell, Newington, Newnham Murren, North Stoke, South Stoke, Warborough. The population falling within the union at the 1831 census had been 13,085 with parishes ranging in size from Berrick Prior (population 52) to Wallingford itself (total population 2579). The average annual poor-rate expenditure for the period 1832-35 had been £13,614 or £1.0s.10d. per head of the population. Wallingford entrance block from the south. © South Oxfordshire District Council. A fever block was added at the north of the site in 1871. 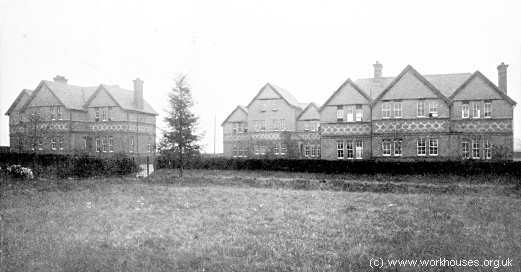 A new infirmary, designed by Charles Smith and Son, was opened at the east of the workhouse on 22nd December, 1898. The new buildings are shown on the 1912 map below. Wallingford infirmary block from the west. Wallingford site from the south-east. 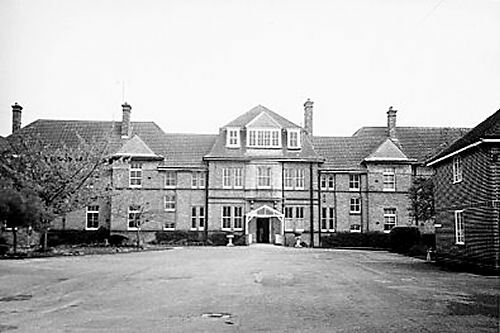 In 1930, the workhouse was renamed Berkshire County Council Institution, then in 1948, with the formation of the National Health Service, it became St Mary's Hospital. 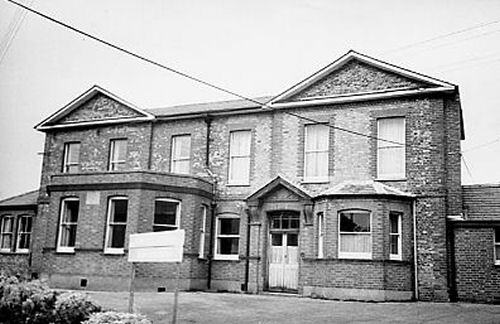 In 1966, the old casual block was converted into an orthopaedic clinic. 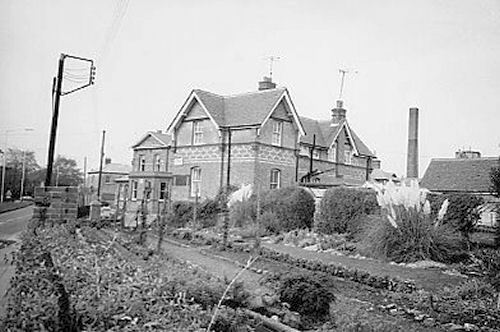 The hospital finally closed in October 1982 and the site was sold for housing redevelopment to Oxfordshire builders Salthorpe Ltd for £1.75 million. 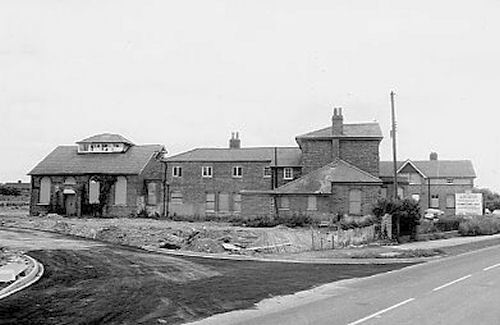 The only part of the old buildings that got a short reprieve was the former dining hall at the north-east of the site, a red-brick building with a slate roof crowned by a ridge lantern. Although the developers were encouraged to preserve the dining hall in some converted form, the building eventually deteriorated to an extent which made this impossible and was demolished. 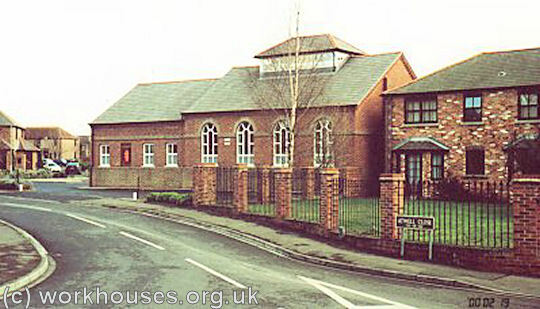 The site is now occupied by a church building which echoes the style of its predecessor. Apparently, a small cellar from the old building remains under the church. In addition to the workhouse, Wallingford Union operated three "cottage homes" for the accommodation of 45 pauper children. 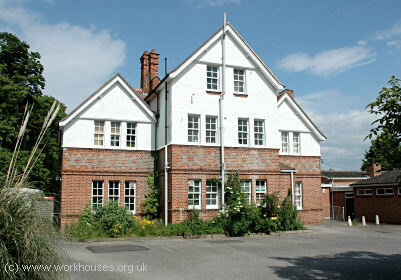 The home opened their doors on on 7th April, 1900, at a site just to the north of the workhouse. The three houses were arranged in a triangle, with smaller T-shaped houses set forward of a larger central block which presumabaly included staff and administrative accommodation. In 1915, infants and girls from the homes were attending the elementary school at Kine Croft. Boys went to the council school on St John's Road. 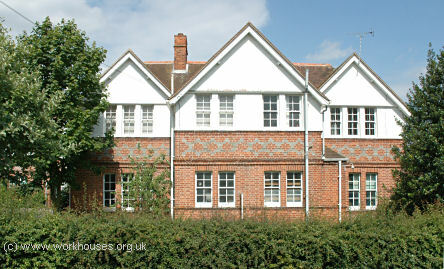 Wallingford Cottage Homes central block, 2005. Berkshire Record Office, Berkshire Record Office, 9 Coley Avenue, Reading, Berks RG1 6AF. Records include Guardians' minute books (1835-1930); 1854-1932); Births (1909-45); Deaths (1909-42); Cottage Homes relief lists (1901-24); etc. J & S Dewey (1989), Window on Wallingford 1837-1914 Pie Powder Press.